Mophing Transforming Lego Scorpion and the Japanese Self, a photo by timtak on Flickr. 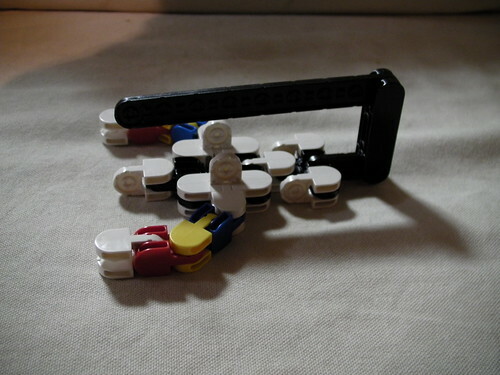 Jurat by Toyda is a kind of Lego for morphing robot makers. I am not sure why Japanese children especially, and anyone who likes the movie series Transformers, are keen on transforming or morphing. There is often a morph between something inanimate and something animate, between a something used, a tool or vechicle and a using thing living robot. The above is a scorpion which morphs from/into a sword made by my son from Jurat morphin lego by Toyda. I would like to suggest that Japanese children (and anyone fond of Transformers, which is most children everyhwere) but especially Japanese children because they remain in a "mirror stage," may be more aware of the Lacanian dictum that the ego or self, which originates in the self-image, is external, dead, a mere tool, and yet at the same time the only self we have. We see, we are, dead people: at best robots, at worst inanimate tools. This dual nature of the self, (1) as a mere tool or representation to grasp a centre-less consiciousness, and (2) as the best -- though "robotic" or prosthetic -- self that we have, may be being played out in the morphining animation movies, and toys such as the one above.